In October 1943, the secretive British Special Operations Executive parachuted a group of officers and NCOs into the mountains of Çermenika, to the east of Tirana, in order to coordinate resistance against the occupying Germans. The Germans soon had the mission on the run, and until early January 1944 the Brits were chased through the snow-covered mountains. With them was a motley crew of Italians and Albanian partisans, led by a mecurial Communist named Enver Hoxha. 03.00 E.F.D. [Brigadier Davies, the mission’s commander] and A.N. [Nicholls] stand-to. Others are more leisurely and typically Albanian, it is 06.00 hrs before we are ready to move off and 06.30 before we actually do so… A very long steep climb brings us over the mountains to the East and thence down to the road which we are to try and cross by daylight. No traffic is seen to be moving and to E.F.D. and A.N.’s horror the place selected for the crossing involves a march across a wide open plain on both sides… By this time Cpl. SMITH is too weak to carry his greatcoat any further – KADRI HOXHA [no relation to Enver] takes it on. At a halt when the woods on the far side are entered, the appalling discovery is made that the whole toe of one of E.F.D.’s boots has broken away… This is very serious. The climb is renewed over the high mountains to the East, making for a saddle. When half way up, 5 shots, followed by 3 more, are fired blind into the hillside in our vicinity. Fearing an ambush on the track over the saddle, a sharp right-hand turn is made, resulting in a truly appalling climb over the highest part of the mtn. It takes a great deal out of everyone, finishing as we did almost on our hands and knees. The route – no vestige of a track – then leads over the most terrible volcanic crater pocked country in which the guides have no idea of the way and involve us in much rock scrambling. As dusk falls, the party, excessively weary and cold, reach the top of the mountain… We have spent most of the day at approx 6,000ft [1,800m] and the cold is intense. E.F.D. and A.N. nestle in each other’s arms in a vain attempt, like the Babes in the Wood, to acquire some warmth. A truly fantastic scene. Eventually the intense cold makes a withdrawal necessary to an area where fires can be lit. This is done and once again we crouch wet and very cold over a fire. What a way in which to spend Christmas! This writer has retraced the mission’s steps, and can confirm that the terrain here is tough enough in summertime. To get across this particular mountain in winter, in deep snow, and in a weakened state, must have been a horrendous experience. 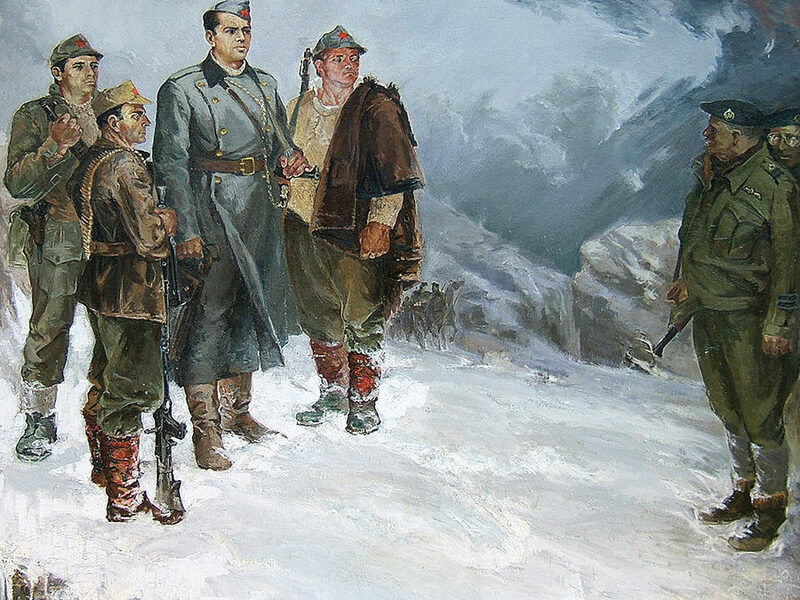 The following day, Boxing Day, saw the confrontation between Enver Hoxha and Brigadier Davies which is portrayed in the oil painting accompanying this post, The Abyss, by Robert Permeti. Davies wanted to continue east into what is now Macedonia with just a few men; Hoxha refused. Two weeks later Davies, by then separated from Hoxha and the partisan leadership, would be badly wounded and captured by local Albanian forces working with the Germans. He spent the remainder of the war in the Colditz POW camp. Physically broken by the ordeal and his injuries, he died a few years after the war. There have long been rumours that Hoxha gave away Davies’ location to the Germans in order to draw them away from his own little party as they tried to break out of the encirclement to the south, but no one has yet been able to confirm this. Anyway, Merry Christmas – all of us at Drive Albania hope you have a more enjoyable day than Davies and his men. To find out more about the activities of the Special Operations Executive in Albania during World War Two, get hold of a copy of The Wildest Province by Dr Roderick Bailey.